In one case, the German Government, on purchasing the islands, attempted to get the island chiefs to repair the roads. The locals resisted. The Germans levied a fine which was extracted by marking a number of the most valuable stones with a black cross. The act impoverished the chiefs and forced them to fix up the roads. The fine was recognized as paid when the officials washed the black mark from the stones. Wealth had been temporarily taken and then restored by affecting their currency. The point of the story is that currency can take on many different forms. Currency is merely a tangible representation of wealth. Wealth must be created by the land or labor of society. If governments create currency unrelated to the actual wealth being created in the society, then we get what we have today; TARP, Ireland, Greece, Spain, and …. As he entered the Little Haiti Catholic church he founded 29 years ago, a crowd of thousands, some with tears of joy, quickly gave the Most Rev. Thomas Wenski the treatment of a rock star on Sunday. Waving their hands in the air, they snapped photos, held out tape recorders and clutched portraits of him. For the estimated 2,500 Haitian Catholics from across South Florida who came to Notre Dame d’Haiti — a crowd typically reserved for Christmas or Easter — the event was not to be missed. 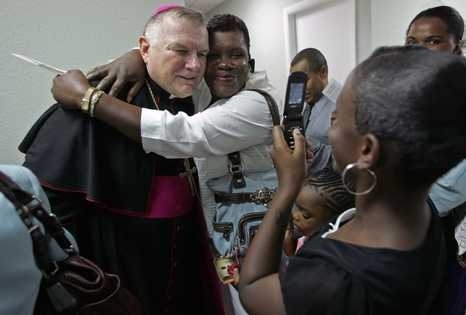 The beloved Polish-American priest, one who had guided the region’s Haitian-American community since its early days, had returned, this time as the new archbishop of Miami. “Many of us are who we are because of you,” the current pastor, the Rev. Reginald Jean-Mary, told a teary Wenski, who celebrated Mass in perfect Creole for more than two hours in the standing-room-only church. On Sunday, after celebrating two English Masses and a Spanish Mass days before, Wenski proudly slipped back into the role he has long played: a champion of Haitian Catholics, who represent a majority of the island nation’s vibrant community in South Florida. “Notre Dame, this church here, it represents the Haitian community,” Wenski said to parishioners, many who skipped work and some who traveled from as far as West Palm Beach to meet the pastor they still affectionately call Pè, or Father. An overflow crowd jammed the church’s courtyard and hallways and packed hundreds of outdoor chairs as a closed-circuit TV system broadcasted the 59-year-old’s remarks. It was his first stop at Notre Dame since he was tapped to lead the region’s 800,000 Catholics in late April. The celebration, full of upbeat hymns, dancing and praiseful “hallelujahs,” brought together faithful churchgoers as well as those for whom church isn’t always a Sunday ritual. There were grandmothers who had not seen Wenski for years, teenagers who he had baptized and those who had only heard of him through word-of-mouth. Victor Hugo’s 19th-century novel Les Miserables tells how pride and neglect of mercy represented in the bitterly zealous legalism of Inspector Javert ultimately destroys him. Today, modern-day Javerts, on radio and TV talk shows, fan flames of resentment against supposed law breakers, equating them with terrorists intent on hurting us. However, these immigrants ask only for the opportunity to become legal — to come out of the shadows where they live in fear of a knock on their door in the dead of night or an immigration raid to their work place. Like Jean Valjean, today’s migrants only look for the opportunity to redeem themselves through honest work. Today, many take umbrage at the Catholic bishops’ advocacy on behalf of these “illegals” — but, in doing so, we stand in a proud moral tradition, like the novel’s benevolent Bishop Myriel, who gave his candlesticks to the desperate Jean Valjean and protected him from arrest by Javert. While I myself am sympathetic to the Arizona law — i.e. what are border states supposed to do when their urgent concerns are not shared by their federal government? — my thoughts and votes on this issue can be affected by those who come to the debate with serious moral currency. In this sense, and this sense only, Archbishop Wenski is the anti-Crist. Back in Novemebr 2008, there was an interesting article about seminarians at St. John Vianney by one of the writers of the Wenski article, Jaweed Kaleem. One of the most positive [i.e. fair] articles on Catholics, was possibly written by a Muslim [my assumption based on his name]. As the old saying goes, only in Miami. Wenski’s Op-Ed in the Miami Herald on Immigration Reform is copied in full at end of post. This teaching underscores the point that positive law, even Divine positive law, is meant to benefit, not to enslave, mankind. The patriots who broke the law by tossing tea into Boston Harbor understood this — as did Rosa Parks, who broke the law by refusing to give up her bus seat to a white man. When laws fail to advance the common good, they can and should be changed. Our immigration laws need to be changed: They are antiquated and inadequate for the promotion and regulation of social and economic relations of 21st-century America. On this point everyone seemingly agrees. However, the solutions proposed should not make the situation worse. Outdated laws, ill adapted to the increasing interdependence of our world and the globalization of labor, are bad laws. Proposed changes, however, must take into account both human dignity and the national interest. For this reason, the U.S. bishops and a broad bipartisan coalition ranging from unions to chambers of commerce have supported broad comprehensive immigration reform that, while addressing future needs for labor by providing for a legal guest-worker program, also offers an “earned” path to legalization for those 10 million or so workers already in the country as well as fixing the unacceptable backlogs for family reunification visas that keep families separated for intolerable lengths of time. A narrow, restrictive legislation focusing on solely “enforcement” will only make matters worse. Indeed, a billion dollars has been spent on border enforcement over the past 10 years — and yet, until this current recession, illegal immigration had increased because the labor market demanded willing and able workers. Illegal immigration should not be tolerated. It leads to abuse and exploitation of the migrants themselves; and, ultimately, businesses that rely on their labor — and, in doing so, help fuel the growth of the American economy — would prefer and benefit from a reliable, legal work force. But, fixing illegal immigration does not require the “demonization” of so-called “illegals.” America has always been a land of promise and opportunity for those willing to work hard. We can provide for our national security and secure borders without making America, a nation of immigrants, less a land of promise or opportunity for immigrants. For this reason, we call upon Congress to seize the opportunity for a comprehensive fix to our broken immigration system. To date, its failure to act has contributed to neo-nativist anti-immigrant sentiment and to ill-advised initiatives like Arizona’s recent immigration law that usurps what is the purview of the federal government. A nation that honors lawbreakers like the patriots of the “Boston Tea Party,” a nation that can allow the dignified defiance of Rosa Parks in her act of lawbreaking to touch its conscience, is a nation that also can make room for modern-day Jean Valjeans. We can be a nation of laws, without becoming a nation of Javerts. As Jesus reminded the embittered zealots of his day, laws are designed for the benefit — not the harm — of humankind. Thomas Wenski is the archbishop of the Archdiocese of Miami. This entry was posted in Books & Reading, Catholic Faith & Inspiration and tagged Archbishop Wenski, Immigration, Les Miserables, Miami Herald, Milton Friedman, Money Mischief, Victor Hugo. Bookmark the permalink. Thank you for posting Archbishop Wenski's editorial. Unlike so many on both sides, he understands the issues on both sides of the debate (i.e. his currency as you well described it). He's 100% correct in that immigration reform is desperately needed. He's also 100% correct in describing illegal immigration as something we can't tolerate. However, there's a little naivete in Archbishop Wenski's de-emphasizing of border security as a key component of reform. The incentive for people to come here illegally are two-fold: 1) easy entry – laws aren't enforced, and 2) businesses hire illegals. Enforce the border (REALLY enforce it) and go after businesses that employ illegals, and most of the incentive goes out the window. Then, and only then, can we do exactly as Archbishop Wenski, and most of us, wish to do, which is to morally, legally and humanely reform immigration. My interpretation of the Arizona law it that it says, since we can't stop illegals from coming over, let's make sure that we at least identify them when we come in contact with them. By itself, that could qualify as a reasonable position. But perhaps those of in the US because our families fled oppressive regimes, should be careful about powers we grant governmental entities in the hopes that they not abuse them. But even the Arizona law implicitly rejects other forms of enforcement. Stopping the flow at the border or penalizing employers. Even the one enforcement angle they have pursued has obviously come with a cost in terms of the State's image. In addition, even their law enforcement agencies appear to be uncomfortable with the new role they have been given. I think all this makes Wenski's point about the solution not lying with more enforcement, seem accurate, not naive. I share your concern about government abusing power, and it's my only real concern with a bill which I otherwise find no problems with. Looking at your explanation of Wenski's comments, I may have been a little too critical. If his main issue is with abuse of the law, then I understand. The Arizona law was obviously a desperate attempt to do what the federal govt should have but hasn't effectively done to date. It's not a perfect law by any stretch of the imagination, but I see it as trying to address one part of the problem. Let's hope Obama and Co. can find the courage to do the rest (not that I'm holding my breath). While certainly the vast majority of migrants come here to seek work there are real and serious problems with crime in border states such as AZ. Were it not the case that murder and drug smuggling were part of the “package” that AZ had to contend with, I don't think they would have resorted to the legislation. In support of his position the Archbishop claims that, “…these immigrants ask ONLY (emphasis added) for the opportunity to become legal…” Well, I think that is objectively wrong given the numerous reports of violent crime and drug trafficking perpetrated by illegal immigrants in border states. Again, not that the majority of migrants perpetrate these acts but it is a considerable problem in border states. His Excellency is demonstrably mistaken and I doubt that AZ would have passed the legislation unless there was a REAL problem. Would the Archbishop not consider that the local AZ government is charged, FIRST, with protecting thier citizens from such crimes? The AZ law is directly calculated to reduce the influx of illegal immigrants into AZ as a way of reducing the crimes that occur as a result. Certainly the USA and individual states are “obliged, to the extent they are able, to welcome the foreigner in search of the security and means of livelihood which he cannot find in his country of origin.” However, “for the sake of the common good for which they are responsible, may make the exercise of the right to immigrate subject to various juridical conditions.” Is not one element of the common good the rule of law? There are real people who's job it is to enforce the rule of law in this country. I don't think it is fair for anyone, to arbitrarily and capriciously suggest, that they do so in a malicious or malevolent way without proof. People are entitled to their good reputation, after all. I would recommend the following essays by Paul Hunker who is Dallas Chief for ICE. First I'll concede and agree with what I think is your main point; If Archbishop Wenski and other defenders of immigration reform which provides a path for legalization of illegals are so concerned about their demonization in this process, they need to be much more careful about demonizing American citizens with legitimate concerns in that same process. Having said that, I can now quibble with some of your specific points. I don't believe there is any demonizing by Archbishop Wenski in this particular Op-Ed [while acknowledging that it happens frequently with people on his side of the argument]. He specifically refers to the Arizona law once as “ill advised.” Otherwise, his focus is mainly on the federal legislation and those 'Javerts' in the public square who oppose his [and the Catholic Bishop's] views. He spells out his Javert criticism when he notes their 'bitterly zealous legalism.' I had to brush up on my Les Miserables characters, but the consensus on Javert character is that he is more misguided than demonish. Now if Wenski had made reference to 'modern-day Villeforts,' you might have had a case then. Re the literary references, at worst, we can say that Wenski was too Cutie by half [and what self-respecting Catholic priest wants to hear THAT], but I loved his use of well known [or easily googled for the memory impaired] characters to crystallize his arguments. PS – none of the above quibbling represents any resentment over your onerous summer reading list assignments. 1) the Church's teaching on immigration includes that “for the sake of the common good for which they are responsible, may make the exercise of the right to immigrate subject to various juridical conditions.” Which seems absent from the Archbishop's and many Bishops commentary on the subject. 2) His reference to Javert is not good nor is it neutral, if it were directed at me I would be offended. How does he know that the the motivation for the AZ law was 'bitterly zealous legalism?' Are there no other possible reasons for AZ taking such action, other than bitterness? To deny this is contrary to the TRUTH which makes it FALSE. 3) His piece is, at least partly, directed at the AZ law and he uses the Church's teaching to criticize the law. However, the Church's teaching requires that the “common good” be considered. His failure to consider the crime and violence that AZ has to deal with is an unacceptable ommission. What's more, he didn't just omit it… he essentially denied the existence of the problem when he said that immigrants ONLY come here for work. Some are trafficking drugs and shooting citizens!